Through this website we are seeking historical materials relating to fuel cells. We have constructed the site to gather information from people already familiar with the technologypeople such as inventors, researchers, manufacturers, electricians, and marketers. This Basics section presents a general overview of fuel cells for casual visitors. What is a fuel cell? 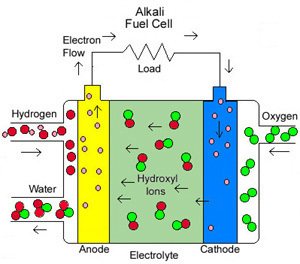 How do fuel cells work? Why can't I go out and buy a fuel cell? Different types of fuel cells. Hydrogen is the basic fuel, but fuel cells also require oxygen. One great appeal of fuel cells is that they generate electricity with very little pollutionmuch of the hydrogen and oxygen used in generating electricity ultimately combine to form a harmless byproduct, namely water. The purpose of a fuel cell is to produce an electrical current that can be directed outside the cell to do work, such as powering an electric motor or illuminating a light bulb or a city. Because of the way electricity behaves, this current returns to the fuel cell, completing an electrical circuit. (To learn more about electricity and electric power, visit "Throw The Switch" on the Smithsonian website Powering a Generation of Change.) The chemical reactions that produce this current are the key to how a fuel cell works. There are several kinds of fuel cells, and each operates a bit differently. But in general terms, hydrogen atoms enter a fuel cell at the anode where a chemical reaction strips them of their electrons. The hydrogen atoms are now "ionized," and carry a positive electrical charge. The negatively charged electrons provide the current through wires to do work. If alternating current (AC) is needed, the DC output of the fuel cell must be routed through a conversion device called an inverter. Even better, since fuel cells create electricity chemically, rather than by combustion, they are not subject to the thermodynamic laws that limit a conventional power plant (see "Carnot Limit" in the glossary). Therefore, fuel cells are more efficient in extracting energy from a fuel. Waste heat from some cells can also be harnessed, boosting system efficiency still further. So why can't I go out and buy a fuel cell? The basic workings of a fuel cell may not be difficult to illustrate. But building inexpensive, efficient, reliable fuel cells is a far more complicated business. Scientists and inventors have designed many different types and sizes of fuel cells in the search for greater efficiency, and the technical details of each kind vary. Many of the choices facing fuel cell developers are constrained by the choice of electrolyte. The design of electrodes, for example, and the materials used to make them depend on the electrolyte. Today, the main electrolyte types are alkali, molten carbonate, phosphoric acid, proton exchange membrane (PEM) and solid oxide. The first three are liquid electrolytes; the last two are solids. The type of fuel also depends on the electrolyte. Some cells need pure hydrogen, and therefore demand extra equipment such as a "reformer" to purify the fuel. Other cells can tolerate some impurities, but might need higher temperatures to run efficiently. Liquid electrolytes circulate in some cells, which requires pumps. The type of electrolyte also dictates a cell's operating temperature"molten" carbonate cells run hot, just as the name implies. The following list describes the five main types of fuel cells. More detailed information can be found in those specific areas of this site. Drawing of an alkali cell. 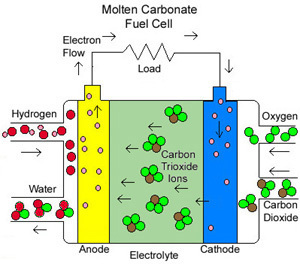 Molten Carbonate fuel cells (MCFC) use high-temperature compounds of salt (like sodium or magnesium) carbonates (chemically, CO3) as the electrolyte. Efficiency ranges from 60 to 80 percent, and operating temperature is about 650 degrees C (1,200 degrees F). Units with output up to 2 megawatts (MW) have been constructed, and designs exist for units up to 100 MW. The high temperature limits damage from carbon monoxide "poisoning" of the cell and waste heat can be recycled to make additional electricity. Their nickel electrode-catalysts are inexpensive compared to the platinum used in other cells. But the high temperature also limits the materials and safe uses of MCFCsthey would probably be too hot for home use. Also, carbonate ions from the electrolyte are used up in the reactions, making it necessary to inject carbon dioxide to compensate. 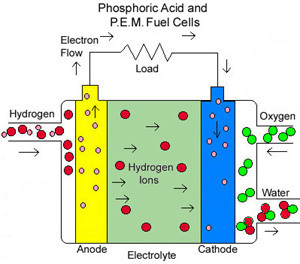 Drawing of how both phosphoric acid and PEM fuel cells operate. Solid Oxide fuel cells (SOFC) use a hard, ceramic compound of metal (like calcium or zirconium) oxides (chemically, O2) as electrolyte. Efficiency is about 60 percent, and operating temperatures are about 1,000 degrees C (about 1,800 degrees F). Cells output is up to 100 kW. At such high temperatures a reformer is not required to extract hydrogen from the fuel, and waste heat can be recycled to make additional electricity. However, the high temperature limits applications of SOFC units and they tend to be rather large. While solid electrolytes cannot leak, they can crack. More detailed information about each fuel cell type, including histories and current applications, can be found on their specific parts of this site. We have also provided a glossary of technical termsa link is provided at the top of each technology page.